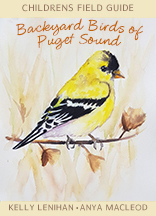 Backyard Birds of Puget Sound is a helpful field guide for young children who want to attract avian visitors and how to best support the species commonly found in backyards. This guide includes 70 beautiful color illustrations of the most frequently observed backyard birds with notes on sizes and distinguishing markings. Birds are the perfect hook for getting kids interested in nature and a window into that world is all you need to get them started on this wholesome, exciting lifelong hobby. There are many great reasons to introduce a children to the joy of owning a dog: dogs help children’s self-esteem, help them learn responsibility and help them learn empathy. However, children and dogs don’t automatically start with a wonderful relationship. In fact, it can be downright challenging figuring out what a puppy needs. 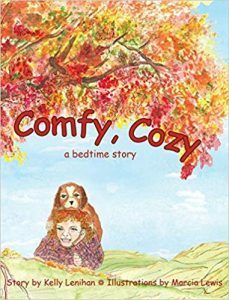 Comfy, Cozy tells the story of Lily, a little girl who adopts a puppy from a pet shelter. When it’s time for bed, the puppy struggles to adjust. Scared and alone without the comfort of his brothers and sisters, follow along as Rosco uses a little puppy ingenuity to figure out how to get comfy, how to make his bed cozy! 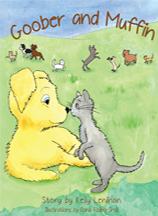 In the back of the book, you’ll find child-friendly tips for introducing a puppy to its new home and a recipe for homemade dog treats. Goober and Muffin were the best of friends; no matter that Goober was a puppy and Muffin was a kitten. However, not all cats and dogs seem to be as tolerant, eventually driving the two apart. When a calamitous misadventure reunites this unlikely twosome, can they turn their backs on prejudice once and for all and go back to doing what they love best, being best friends forever? 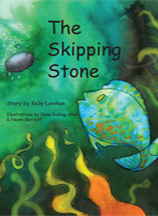 The Skipping Stone is a story about Nick, an ordinary little boy fervently yearning for something extraordinary to happen. One day, on a family outing, his dream comes true in a rather unusual way. When Nick’s wishful thinking finally pays off, could it be that he ends up with a special memento to remind him of his extraordinary day? In the back of the book you’ll find two bonus sections: Did You Know? and How to Skip Stones. Learn some fun facts about stone skipping as well as pointers on technique and how to choose the best rocks. Join Kelly on her quest to learn more about the majestic American Bald Eagle. 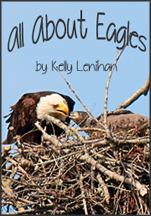 Kelly spent two years observing and photographing the family dynamics of an eagle family and shares insights into their behavior through photographs captioned with humor and appreciation. Both entertaining and factual, it’s sure to excite budding junior birders everywhere. So grab your binoculars and come along for a delightful introduction into the day-to-day life of our national bird.